Sorry I'm so late with this one! Thank You to The Stampman for sponsoring our Inky Fingers challenge and to Kim Reygate for humouring me and being our special guest! We had fabulous entries, I keep going back for more peeks!! 128 - Sue C! Well Done Sue, please email me to claim your £10 voucher for The Stampman. Our Top 5 DT choice for this challenge in no order was.. Thank You for your fantastic takes on Judies photo challenge, some beautiful creations there ladies well done! The winners of that will be announced at a later date. Thank You again to Joanna Sheen for sponsoring us. Thanks also to Laura for being our guest designer and Lori Aragon for being our special guest, both with stunning designs. Our spotlight on easels challenge is still open for another week which you will find here. Don't forget both challenges run for 2 weeks each so if you make an easel for this challenge you can also enter it into the spotlight one too! I'm a bit behind at the moment so I'll be doing the winners of the Inky Fingers challenge in the next day or two, sorry for the delay! We are delighted to be sponsored by the adorable & extremely talented Chelsea who has her own online store. Thank You Chelsea! Lets have a look at what the DT have been up to for this challenge! I used a pale yellow card which has an oval shape in the middle of it which can be taken out, but as I'm not sure how to use this type of card I left it in place and put on it 4 dolphin Peeloffs which I coloured using Acetate & Peel off pens, according to the colours on their pen lid they were yellow & orange although when I used the latter on the card it looks more like brown doesn't it? I then added a frame using watercolour pencils, at the top I used a blue one with a green at the bottom, I then added some yellow iridescent stars in the top two corners & a Gold Happy Birthday at the bottom. Finally I stuck a piece of white hand made paper on the inside so that the shape didn't come off! I've used an image by Pollycraft coloured with promarkers and coloured the hearts on the dress with an orange sakura stardust pen. The ribbon has been dyed wth a yellow promarker and the faux stitching is a sakura souffle pen. I used a martha stewart punch (my one and only one!) and sprayed the whole card with diamond dazzles glimmer mist. 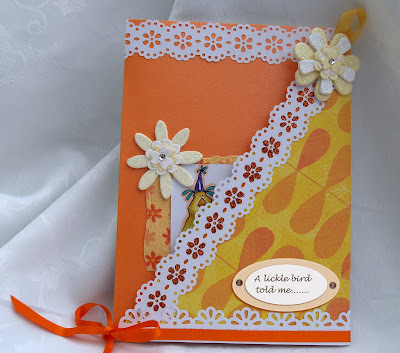 White scalloped card to start, with a piece of Kanban Edwardian Orange card for the background. The fish are digi's from Bee Crafty printed out in different sizes, coloured with Pumpkin & Bright Orange ProMarkers & mounted with foam pads. 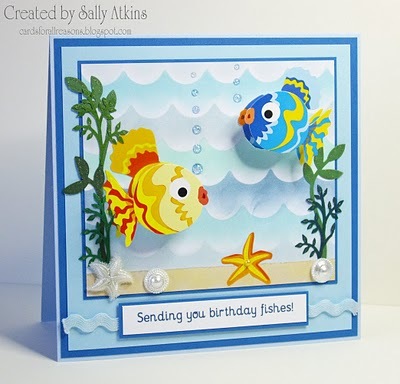 I've run them through the Cuttlebug Swiss Dots folder for a bit of texture and added orange Stickles Glitter to their fins. The underwater foliage is punched out from Doodlebug Sugarcoated cardstock using a Nellie Snellen branch punch and the bubbles were punched using a household hole punch! 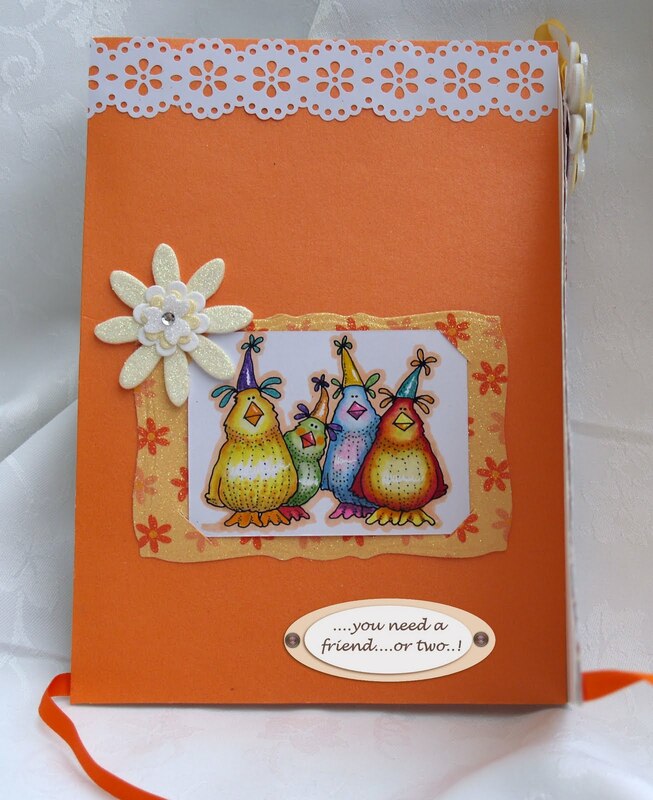 I have used a digi stamp from Meljens designs, coloured the image with Promarkers and mounted it on to orange then yellow card, the edges have been punched with a Stampin Up scalloped border punch then trimmed with some gingham ribbon. 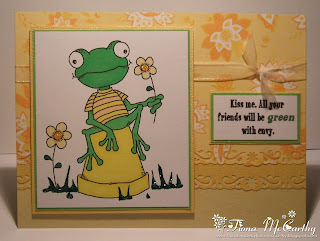 The sentiment was also punched with a Stampin Up punch and edged with ink. My backing papers are both K&Co. I picked an image drawn by Marianne Walker from I Like Markers and colored it with Copics. I sprayed it with pearl Glimmer mist and added pearls. Next I took a 12 inch stripe of paper and punched(MS) and folded it to make a border around half the image. 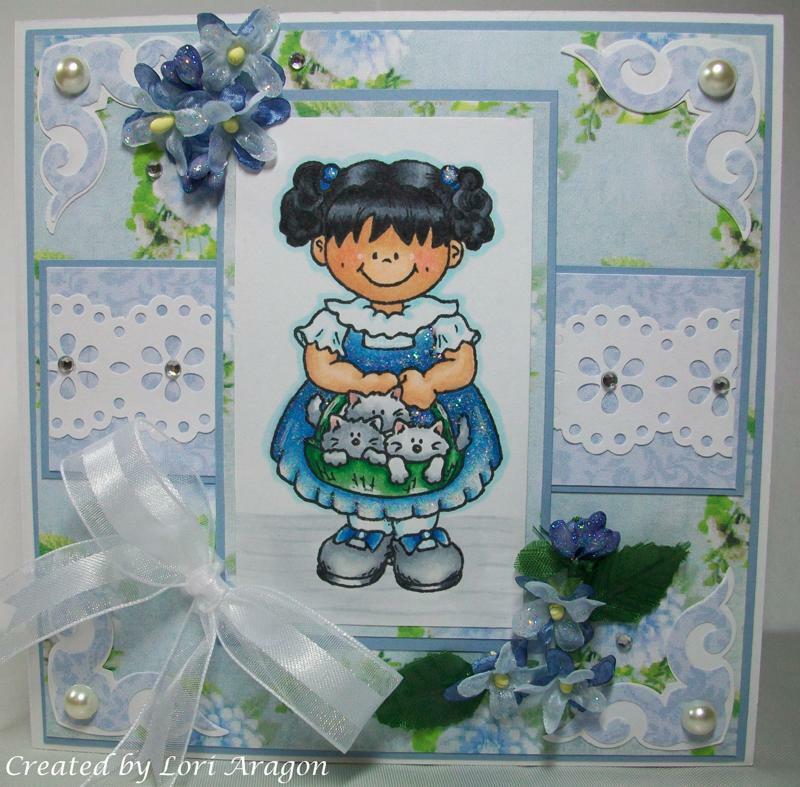 Then I stacked 3 prima flowers and added diamond dust to the top, added ribbon and rhinestones to card. I sponged onto white card with distress inks in Dried Marigold, Scattered Straw and Spiced Marmalade and dusted over the top with Cosmic Shimmer mica in Mango Orange. I inked up my cat with versamark and stamped it in the middle, and also stamped the paw prints and sentiment. This removed the CS and I dusted back over the areas I had stamped with CS Topaz Sparkle. I gave it a light mist with CS Angel which I mixed with water. The punched background is a MS punch around the page which I cut smaller than the sizes they recommend and by being very careful managed to get it to match, but if it didn't the flowers I intended to put in the corners could have covered up any mistakes in the pattern, as it was I was able to bring them in a bit more from the edge. 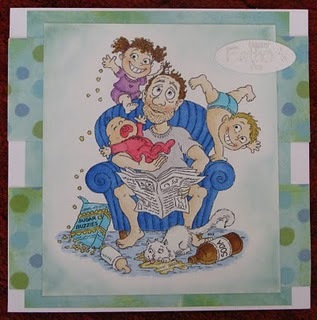 I have used a digi stamp from PollyCraft for my image and the sentiment is from Tiddly Inks. 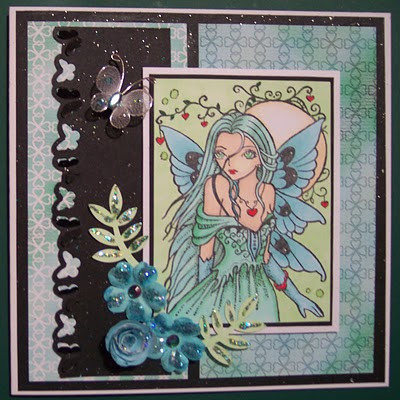 For the borders I used one of my X-Cut border punches. I have coloured the image with ProMarkers and added some stickles glitter glue to the flowers and grass. The ribbon, paper and card are from my stash. 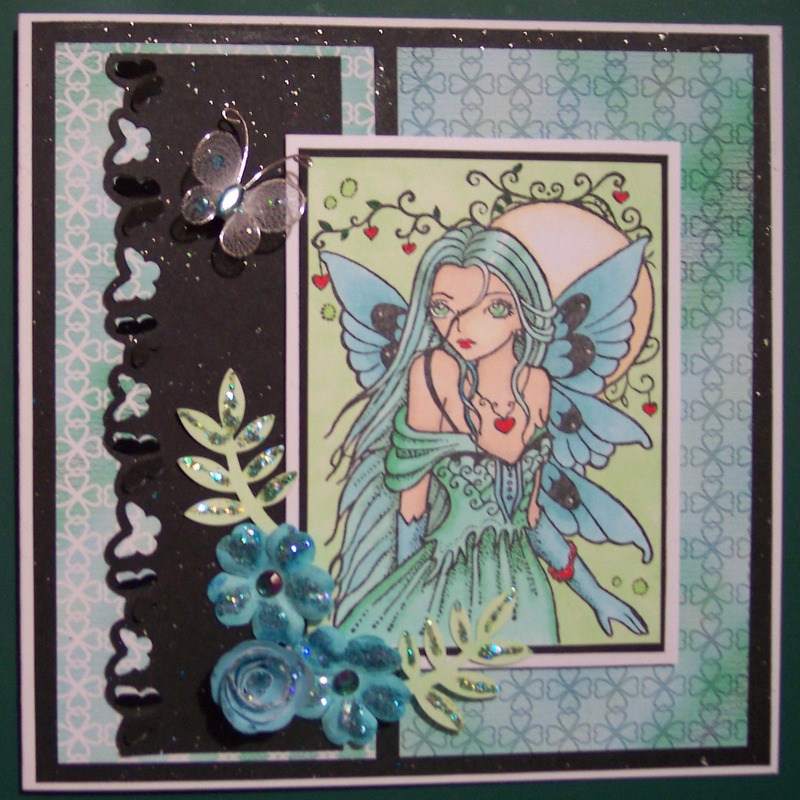 I stamped my image onto card and coloured with promarkers adding touches of glitter onto the flowers. I cut the corners of the card with a fiskars punch then mounted the image onto yellow card, then again onto patterned orange paper. 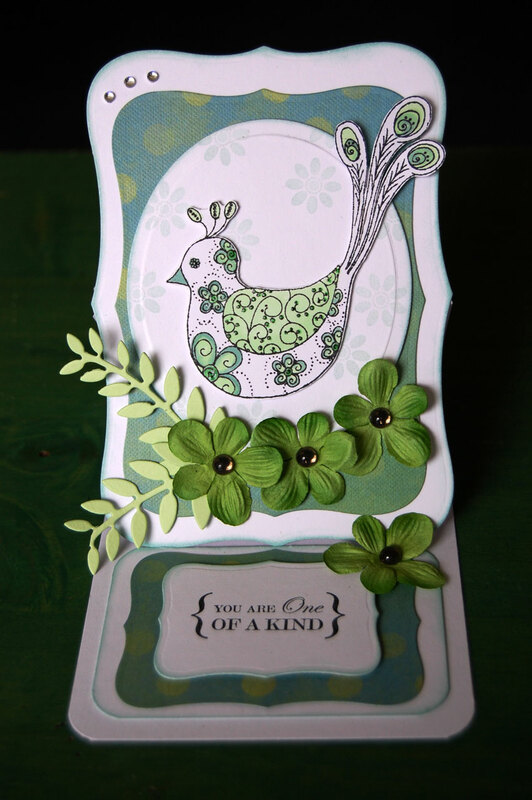 I covered the front of a square card with a leaf patterned paper and mounted the layered image onto the card. I coloured some flowers with promarkers and added layered them keeping them together with a brad and cup which was then mounted onto the corner of the card and the gems were added. Please add a link to your creation into the froggy below. The challenge will close at 12am midnight GMT on 9th August. Good Luck! We're baaaaack! Welcome to our very first spotlight challenge! These will run alongside our regular fortnightly challenge here but they are challenge in their own right and also run for a fortnight. 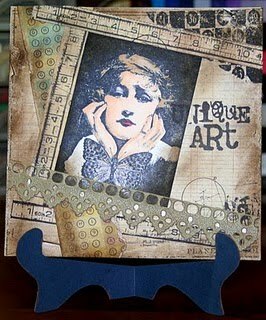 On the spotlight challenge we will look at a style of card, technique or product with the team making various wonderful samples which should give you loads of ideas. They are just for fun, no pressure challenges so no Top 5 but we will offer candy from time to time. I'm offering a little candy for this challenge which includes some wild orchid flowers, prima wildflowers, sticky gems and stamped images. Lets have a look at the teams marvellous creations! I took my inspiration from the colours and the hearts in the photo and decided to make an easel card. I decided on a hexagon. Don't ask how long it took to get the shape right! I made a template and cut out the card and the DP the sizes I wanted. I used Basic Grey Kioshi DP and inked all the edges with Bundled Sage Distress Ink. The Forever Friends image is coloured with Promarkers. 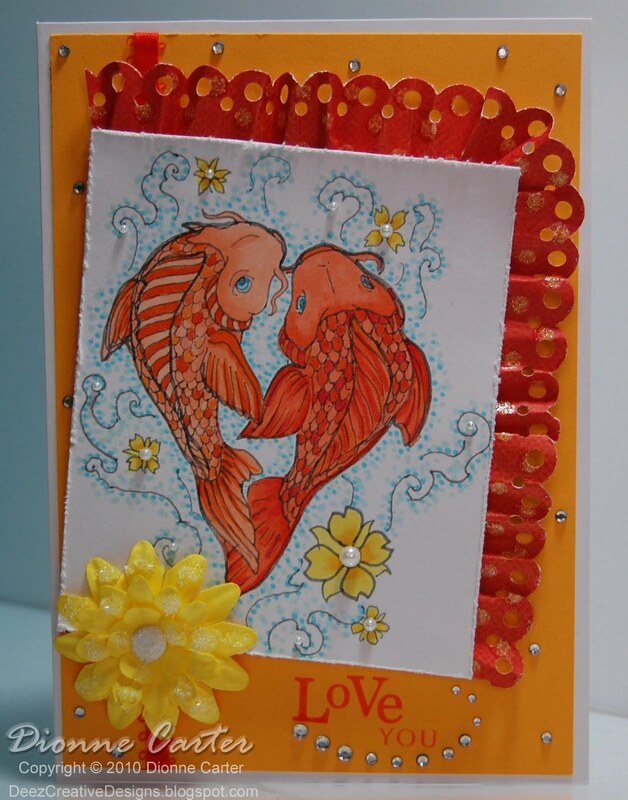 The card candy and punched heart are also coloured with DI and I added stickles to the heart. I finished off with a Craftwork cards sentiment and some lace, buttons and string. The colors were my inspiration. The card was cut with the Cricut Expression using Life's A Beach. The fish is cut from felt and then coated with stickles. 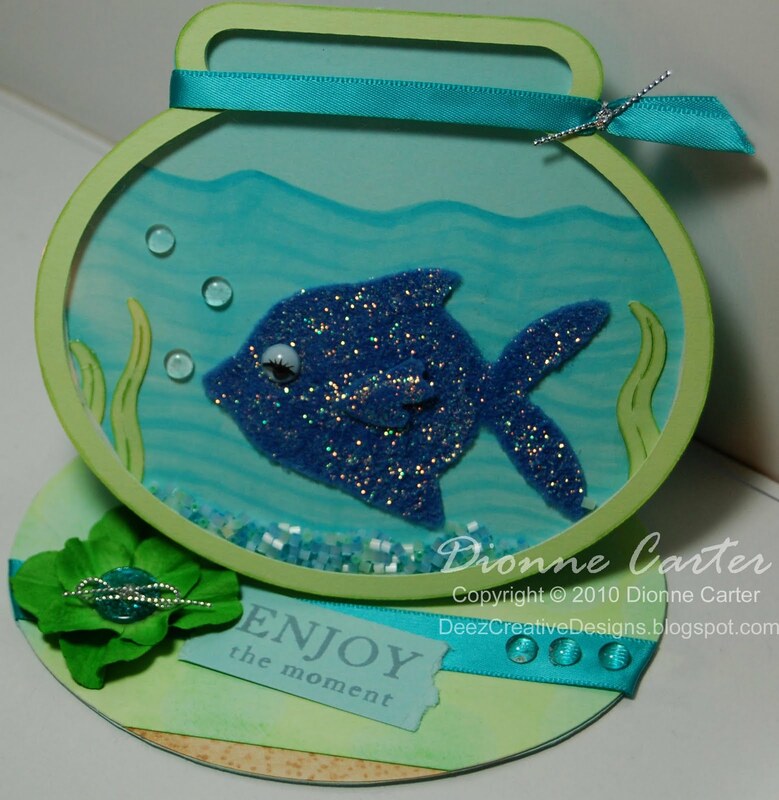 The fish bowel is cut from acetate and pop doted, and I added blue/green beads as the gravel. Here's my Easel Card. As with last week's effort, I've used the love-hearts colours but cut out a butterfly shape from an A3 card folded in 3. The lovely blue paper is, I think, DCWV. Inside is lined with teal glitter paper and the iridescent material is Fantasy Film. For this challenge I've taken the colours as inspiration and used starburst stains to make the backgrounds which have been cuttlebug embossed (Jules Jewells folder) The flowers were white and I've sprayed them with starburst stains to match. I made a gatefold card and mounted that on my easel base and the stopper is a recycled clock from a travel clock which I've attached by cutting a hole in the base and slotting it through so you can change the batteries! The inspiration from the photo I used was the colours and the wording, I have made a couple of easel cards but this is my first shaped one, I used a circle embossing template to cut around, the background papers are from a free sample pack I got with a magazine, the images are digi stamps coloured with promarkers. I even coloured the ribbon with promarkers which again I have never done before it was actually blue and I coloured it with a yellow promarker. Finished with some flowers layered and gems. I picked the colouring from the photo and used the Go Kreate Concentrics Frame Pointy #1, to cut the card shape. If you want I can come back and post some pics showing the various stages, or indeed come back and edit this wording! 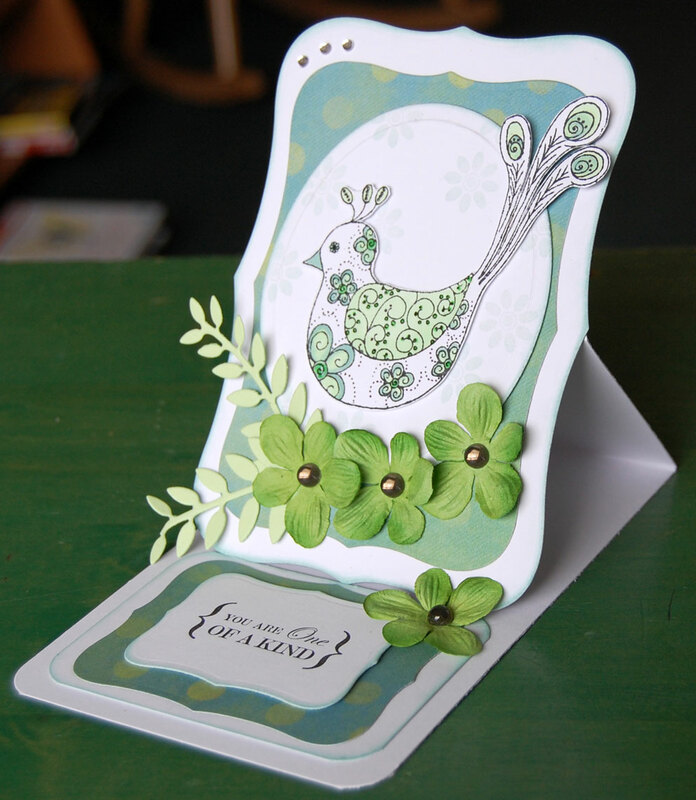 the card and toppers are all from the Kanban Free As a Bird range. 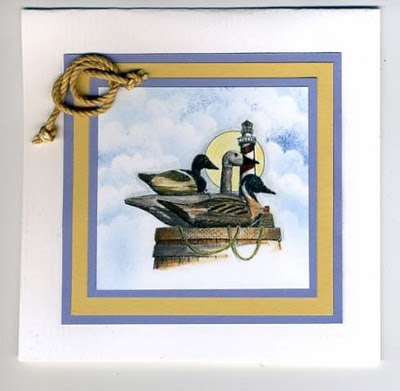 I used my largest nestie label die to make the top half of the card but kept the bottom a recangular shape and just rounded the corners - this worked quite well as I was able to use the smaller labels horizontally on the base. 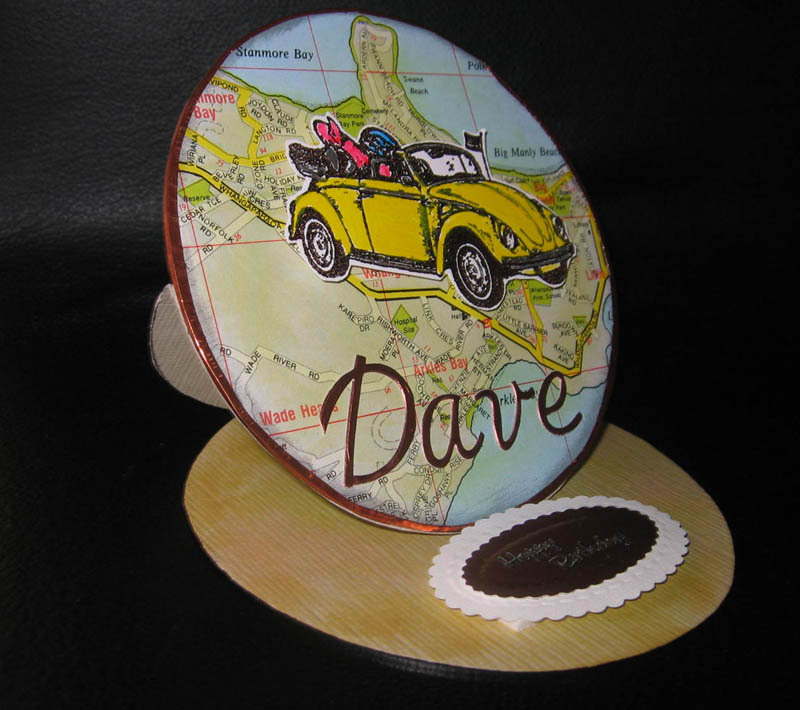 I used papers from a K&Co matt stack and a Dimension Fourth image which I coloured with Promarkers cut then out and mounted on a nestie circle. I saw a tutorial on how to use traditional Swedish heart baskets on cards and knew I had to try it. I used paper by Papermania to create the woven hearts. I stamped swirls around the edge with distress ink - Peeled Paint and then added stickles to these. I then distressed the edges of the hearts with the same distress ink. 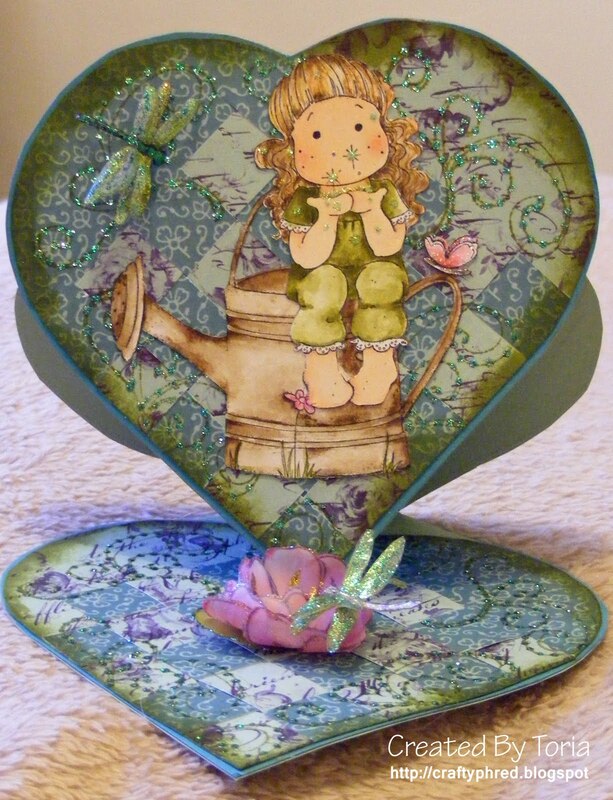 I stamped Fairy Dust Tilda and Watering Can in Memento ink and then coloured them in with Distress inks and copic's. I added stickles for the dust and added glitz. The waterlily and dragonflies are stamped onto parchment paper. The leaf a circle of parchment paper. I coloured them with inktense pencils, distress inks and stickles. I added Glossy Accents to the dragonfly bodies. Wow! Thank You for your awesome entries for the Inky Fingers challenge! Lots of folk milling around with various coloured hands lol! A quick thank you to The Stampman for sponsoring us and to Pauline for being our GDT and Kim Reygate for being our special guest. We will announce the winners on or around 25th July. A quick note also that The Stampman have a brand new challenge blog starting soon you'll find here. Before we move onto the challenge I'd like to explain the huge changes taking place as of today. We have doubled the team size and will now be WEEKLY! 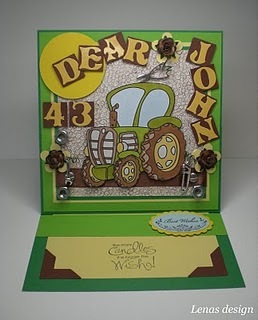 Well as we're Crafty Cardmakers and tend to be a bit off road sometimes that will be weekly with a difference! Here's how it will work! We will post our regular challenge every other Monday as normal, you will still have 2 weeks to enter. Some of the team will show examples of their work for the challenge. The following Monday the team will be doing a SPOTLIGHT. We may cover a style, technique, product, something specific. Now we will also be following the challenge previously posted but you may choose to do that too or have a go at just the spotlight. 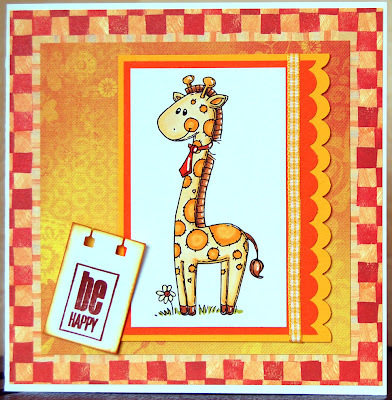 For example next weeks spotlight will be on easel cards, the team have based their easels on the photo inspiraton challenge. You may choose to do this too in which case you can enter your easel into both weeks or you can enter any other easel into the spotlight only. You will also have 2 weeks to enter this until the next spotlight. We can squarely blame Judie for this one!! I sent her off on a mission to find or photograph something to use for this challenge and this is what her crazy mind came up with lol! If you've never done a photo inspiraton challenge before have a look through the DT examples. You can choose to have the colours as inspiration or perhaps the hearts or all of it. Choose one or two colours to focus on or all of them. Lets have a look how the team have interpreted the photo! Some of the girls are having their first run out so lots of loves for them! When I saw the photo I loved the colours and knew I wanted to include actual Love Hearts somehow. It’s my 21st in about a week and I’ve been given a Craft Robo as an early birthday present so thought it would be the perfect opportunity to put it through its paces. I did a quick sketch of what I wanted to create then drew the shapes in Inkscape and cut them on the Robo. 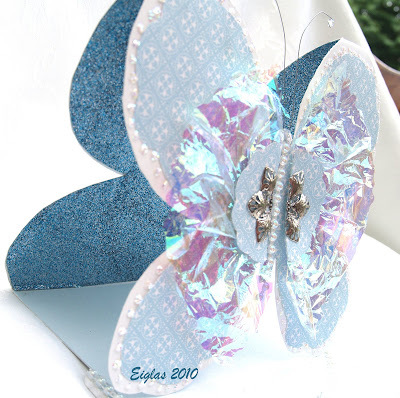 After assembling the pieces using a Treat Cup from Stampin’ Up I decorated with glitter,ribbon and tiny sequin hearts. The text (US Artquest) was stamped on glossy card with Versamark ink to get a resist effect, then heat set, followed by sponging Adirondack Meadow and Pool inks all over, then stamping the text randomly with each colour. The flourish and flowers are part of the stamp, so the little girl (Lost Coast Designs) was stamped in Permanent ink, then again on white matte card, cut out, coloured with Promarkers and the two inks, then glued her over the top of the stamped image. 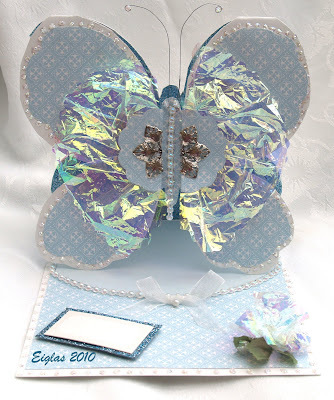 The flowers were coloured with Gel pens and embossed, the wings glitter glazed. The words (Paper Inspirations) were stamped on white card, cut out, layered onto black card, then attached randomly, with heart brads and gems to complete the theme. Following instructions, I've taken my inspiration from Judie's photo and used all the duck-egg Love-Hearts from five packs (...someone ate all the others...! ), a piece of Laura Ashley drawer-liner punched with a Martha Stewart border punch, topped with some Victorian wallpaper (the design, not the actual wallpaper...!) and Nestabilities Pendant die-cut. I finished it off with a MS Filigree heart punchie over a scrap of darker duck-egg paper and a small ribbon bow and silvertone heart charm. 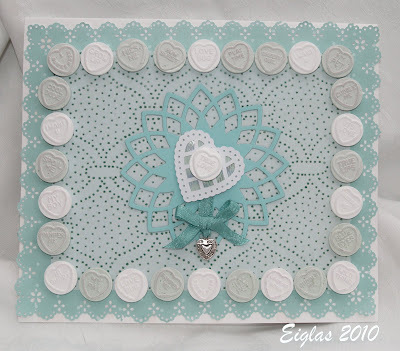 I used a white square card and using foam pads I fixed a coloured heart in each corner, adding another four smaller hearts under each one, I then added a circle in the centre on which I had fixed another for smaller hearts and then put a red flowery shape in the centre of it. All of the hearts are all either textured or have patterns on them which I like as I decided that it gave a bit of extra interest to the whole design. Although in fact it didn't work out the way I had thought about doing in the first place I do like the way that it's turned out. I took the whole gazibo !!! The colours, the Hearts and the words, cus im greedy !!! My is a Photo frame not a card this time. 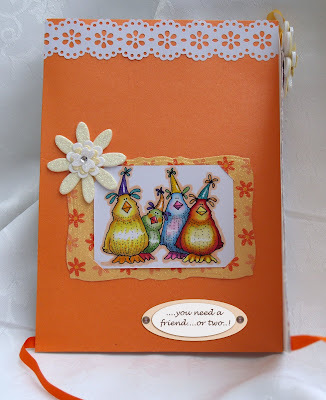 I have used Olive and Blueberry Autumn inks and Vintage inks mixed with micra powders to get the effect I wanted. Stamped on the hearts with the same inks but not mixed. Sprayed the flowers as well and added some beads. I immediately knew I wanted to use some mega cute Quickutz dies I have had for a VERY long time and I am ashamed to admit I have until now NEVER USED THEM!! Papers are the new Papermania Summer Blooms. I used my ever faithful Martha Stewart Doily punch to cut the 'ribbon' and used a small magenta ink pad to distress the edges of all the papers and elements. The Forever Friends bear is a clear sticker. Last but not least I added some FF message stickers from Papermania which I coloured with a pink Promarker to the inside of the card. I took my inspiration from both the colours and the theme of the photo. The image is a combination of Stampavie's A kiss for Chloé which I stamped first, masked and then stamped Magnolia's Love Hearts and Banner. Coloured with my prismas and OMS, apart from the skin which I did with promarkers. Background papers - Nitwit's Joyful Hearts Digikit, and Basic Grey's Kioshi, and the borders are made with a MS punch. Little bit of ribbon, and a heart embellishment for the middle and two decorative filigree metal corners to finish it off. No flowers again. I must be cured, lol. I was really stuck with what to do with the colours from the pic, but after seeing the new papers from docrafts I was all set! I used the new Summer Bloom range of papers adding ink to the edges to bring through the lime and blue colours. I made a tent card from A4 card and covered in the paper, cut out centre with my nesties. Layered the centre and added wee rings bits so it can swing. Finished with "MUM" and lilies as its for my Mother-in-Law. some gloss and glitter to finish. I took inspiration from both the colours and the hearts from the photo. The image is a stamp from Victoria Case,I have coloured it with ProMarkers.I have used digital paper from Pink Petticoat for my background.To make sure it matched perfectly I opened the Inspiration photo in Paint and used the colour picker tool and picked the colour from the photo.I then used this colour to paint my Paper.The sentiment is from Craftwork Cards and the pearls,ribbon and charm are from my stash. I used the colours from the photo inspiration and added some hearts too. I used 'Red Hearts' by Ching Chou Kuik/Sweet Pea Stamps, and coloured her with Promarkers. 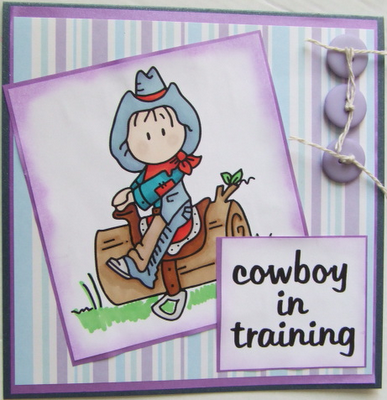 The background papers were designed in Photoshop Elements to match the Promarker colours. I also used a Martha Stewart border punch, and finished the card with some flowers - either a gift from a crafty friend or in the case of the rose, made from scratch - punched leaves, a little Stickles and a butterfly! I loved the photo inspiration and decided to go with the colour theme for my card. The stamp is from PaperArtsy Asian Plate 2 on a background made with Brilliance Inks (and an extra bit of blue brushed on the flowers). The larger bg is brayered (Big & Juicy Waterfall) with a leaf from Elusive Images Tall Trees plate embossed in white. Found a bit of ribbon and this curly thing when I tidied my Craft room and thought they went perfectly. From the Photo Inspiration I have taken the colours & Love theme. The digi is from Bugaboo, coloured with Pastel Green & Blue ProMarkers with Sakura Glitter highlights. Their hair is coloured with silver glitter-glue & the dress has green gem spots. 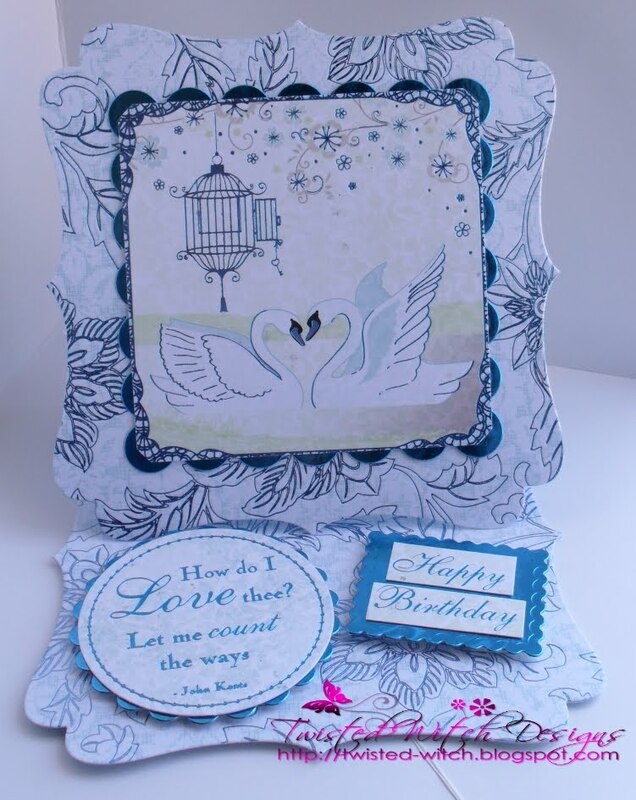 The backing paper & punched hearts are from the Basic Grey Kioshi collection. Sentiment is computer generated. Remember you still have 2 weeks to enter but pop back to join in the spotlight next week too! 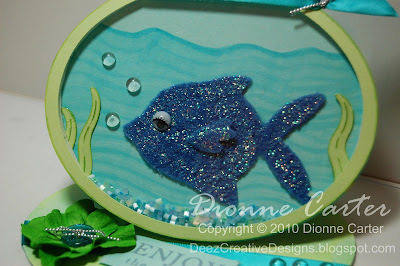 CRAFTY DEN Well done Denise, please email me with your details to pass on to Joanna! Our Top 5 choices for this challenge which I say this every time but it is a really hard job to choose but we've chosen..
Well Done ladies! Please grab your Top 5 badge above. We'll be back at 12 with our new challenge and details of our brand new changes starting today!